We get it — having your photo taken can feel awkward or make you feel really nervous. 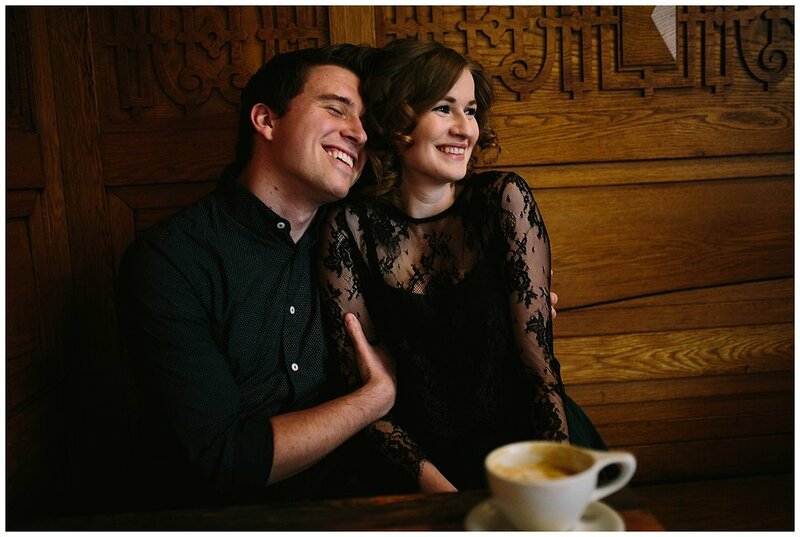 Even I was nervous when we had our engagement photos done, and hey, I’m a wedding photographer! Here’s some tips & tricks to help your session go smoothly and have some fun. Do something you two would normally do on a date. We always strive to make our engagement sessions feel more like a double-date than one long photo session. What’s something that you and your partner normally do for fun? For Annah and Trevor, that’s getting coffee at Coat Check Coffee. They also like hiking (Trent and I loveee hiking and outdoor photos, so we almost always do some part of the shoot outdoors!) so we went over to Eagle Creek Park and they braved the cold for some pretty wintery photos. We’ve done engagement sessions with picnics, record store shopping, swimming in a creek or dancing in a water fountain, climbing mountains or just chilling at home on the couch. You can incorporate something that’s just fun or something really sentimental. 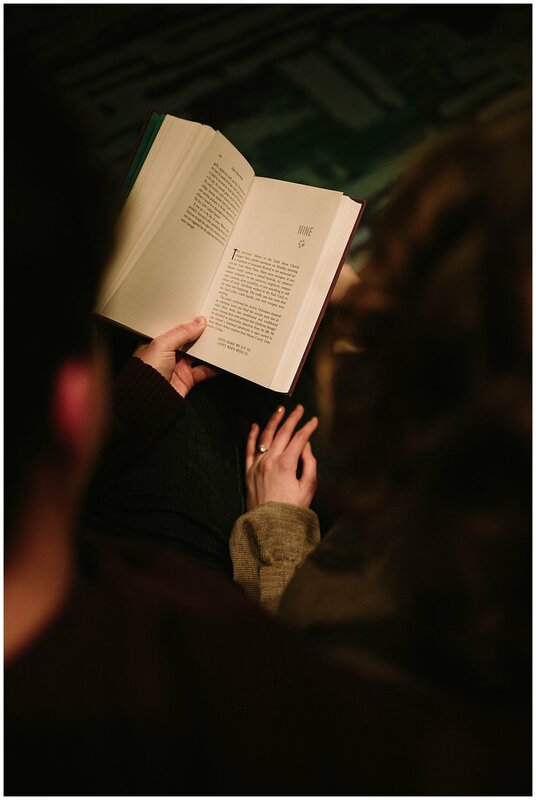 Trevor and Annah chose to end their session at the library where Trevor proposed and they came on many of their dates, so the place was dear to them. Wear something you’re comfortable in. We get it, shopping is fun, but save the new outfit for another time and buy an accessory to wear for the shoot instead. You want to feel 100% comfortable in what you’re wearing. Ask your photographer if they have a preference of what you should wear or if you have any questions. Have a drink beforehand. This could be how you start your session or something you do before you meet up with your photographer. It helps calm the jitters. And if you start the photoshoot at a bar or coffeeshop, you’ll have something to do with your hands. Bring your pets! We love capturing couples with their pets. We suggest starting with the photos of you and your pets, then having a friend pick them up while we focus on the rest of the session. Be on time (or better yet, early). This will help calm your nerves even more and is a trick that I use myself to help me not me nervous for things. Leave earlier than you think you need to add extra time for traffic. If you’re late, it can cut into the photoshoot time when the light is pretty and you don’t want to miss pretty light. Decide whether or not you want a morning or evening session. We typically only do engagement sessions on weekday mornings or evenings, but it’s different for every photographer. We like photographing either 30 minutes before sunrise and into the morning or an hour and a half before sunset and taking photos until dusk. Figure out what works best for your schedule & for you. For example, if you’re not a morning person at all, you probably don’t want to do the sunrise session! Decide if you have a season preference. We do most of our sessions in spring and fall, but we definitely still do shoots in the summer and winter! If you really dig the fall leaves look, then make sure you talk to your photographer about scheduling in advance. If you love neutrals and don’t mind being cold, then choose a winter session like Annah and Trevor did!